Television personality, broadcaster, professional MC and Business speaker on Political Comment. Born and raised in Auckland, Bill Ralston is the irrepressible editor of Auckland's Metro magazine, and anchor's the high rating, "Backchat" public affairs programme on TV1. One of the country's best known media figures Bill has a background of more than twenty years in the media; radio, television and now print. He has worked for Television New Zealand where he was exiled to Wellington, spending many years in the press gallery in parliament. Later he joined TV3 - first as political editor, later as host of his own Ralston Group programme and then for five years as the currents affairs host in 3 National News. During this time he also fronted as a talkback host for various radio stations like Newstalk ZB and Radio Pacific. He also attracted a lot of attention for his outspoken satirical columns in newspapers like the Independent. Bill's appeal lies with his integrity as a serious journalist balanced by his reputation for audacity and dry irreverent commentaries on the political and social developments in everyday New Zealand life. With his own unique sense of humour Bill has poked fun at every politician who entered parliament since the days of Sir Robert Muldoon and, now, the editorship of Metro magazine gives him a good chance to tickle Auckland's funny bone. 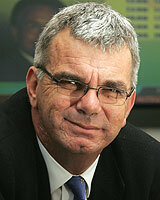 Bill Ralston is a lively, irreverent and highly entertaining speaker on matters New Zealand. His feel for what is happening and what might or might not impact on New Zealand is always close to home. His programmes always receive the highest accolades and ratings.